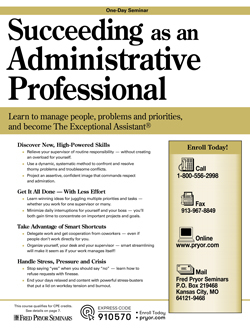 After this administrative assistant training, you'll handle the demands of your job with the confidence, judgment and professional acumen of the most experienced, capable assistants. And, equipped with increased skills, you'll open the door to more responsibility, great credibility and increased pay and status. Five signs you’re just doing a job — and five powerful steps that will help you move toward a rewarding career. Six simple actions to move your job toward more challenging and responsible activities. Four insightful questions you can ask yourself to put your career and goals into focus — and better understand what you want from your job. Nine key duties you can execute that make you indispensable to your supervisor and your organization. How to take the initiative and make decisions — you’ll lessen the burden on your supervisor and assume more responsibility. When your manager is gone or unavailable — what you can do to make things run smoothly and efficiently. How to be more assertive and confident in day-to-day communication with key managers and executives. A three-pronged approach that reduces the day-to-day stress you face in your job. How just 10 minutes every day can reverse most of the negative stress you encounter — even if pressure seems unavoidable. How to deal with the restraints and demands of multiple supervisors who all need your time and attention. The worst days and hours: how you can eliminate the most common “stress pockets” and smooth out end-of-day and end-of-week pressure. The one key to working smarter, not harder — and getting more done every single day. Four ways to set priorities — you’ll learn which is the best approach for any situation. 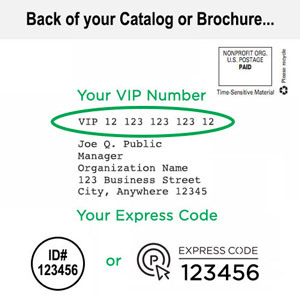 An innovative system to establish firm, reachable deadlines — and stop the “ASAP” crunch. How to say “no” or refuse a request — without sounding negative or feeling guilty. A seven-step process to deal effectively with any problem — no matter how big or how small. Tips for developing alternative approaches to problems — and pinpointing a solution that appeals to everyone. How to present your problem-solving ideas to your supervisor — and earn respect and credibility in the process. Six essential steps to implement the solution to a problem — learn how to increase cooperation and ensure success. Six things you should not say when making requests and resolving problems. An eight-point script to ask for — and get — what you need to do your job better. Why you should suggest your solution first — and not leave it up to your boss to solve the problem. Five ways to reach an agreement and get a commitment for your request — you’ll prevent misunderstandings and increase efficiency. How to use feedback to prevent costly mistakes and misunderstandings. What to do when you’re not getting enough feedback from managers or coworkers. Three key principles that ensure better two-way communication in every phase of your work. How to detect a breakdown in communication — before a crisis situation develops. Three ways to get someone to act on your requests by demonstrating the benefits first. How to develop a simple plan before asking for action — and increase your chances for on-thespot agreement. Two ways to counter expense resistance by demonstrating the benefit of an action outweighs the cost. How to be more persuasive than you ever thought possible — a dynamic “benefit formula” used by the most successful sales professionals. Are you just efficient ... or effective as well? How to go beyond doing the job right, to doing the right job right. The powerful “80/20 Notebook” system — have every planning tool you need at your fingertips. Much more than a list: the 6 essential elements of the super-effective to-do list. How to develop a daily plan that keeps you focused and on-track. How to anticipate an approaching crisis — and avoid it before it erupts. Smart planning tips to reduce crises and unnecessary shifts in priorities. Eight easy-to-understand steps for producing a realistic action plan for projects and priorities. How to estimate the time a project will require — and eliminate crises caused by time overruns. Five specific measures you can take now to halt interruptions that put a dent in your day. How to use time logs to avoid interrupting your boss with questions and queries. The sure-fire “quiet hour/mad hour” schedule that gives people access to you — and still gives you time to concentrate on top priorities. A little-known management technique for gaining control over interruptions. Five clear steps that show you how to delegate — even if you don’t have authority over other employees. “I can do it better and faster myself” — how to overcome the #1 barrier to effective delegation. How to pass along work without worry: 10 ways you can ensure the assignment will be done right and on time. What to do when people don’t do what’s expected or refuse to cooperate with you. How to answer questions and make decisions in the absence of your supervisor. Three specific situations that offer opportunity for job growth — and how you can take full advantage of them. How to demonstrate you’ve earned an increase in pay, responsibility or title — and get your manager’s full support. A proven method to find out what’s expected of you — and whether or not you’re delivering what’s expected. Security Rules: Need-to-know procedures for preserving confidential information. A quick assessment to determine whether you can handle the call for your boss — your initiative and dependability will be appreciated. Three intelligent telephone tips that shave minutes off of every phone call — without being abrupt or blunt. Techniques for writing clear, concise emails that get an immediate response. Unintentional email practices that can lead to conflict and misunderstandings. How to prioritize the demands of more than one supervisor to everyone’s satisfaction. Dozens of tips for day-to-day duties, including messages, mail, work assignments, appointments and scheduling for multiple managers. Who’s in charge? What to do when instructions from one boss conflict with another’s. A smart method that gets your supervisors to cooperate with each other — without putting you in the middle.